POWER TO GO products for recharging your phone and other devices by MemoryBeach. Need some help finding products? Your memory needs power to function. So do your electronics. 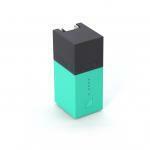 MemoryBeach’s curated on-the-go power selections must meet 3 criteria: attractiveness; simplicity; and highly functional.. When you are busy, it’s easy to forget that you are using up your charge on your small electronics, whether that’s a phone, tablet, or headphone device, run out of power. We have looked for recharging devices and cables that do more than 1 function, so that you free up your mind to remember other important things. We recommend having more than one recharging back up system, because wherever you work, you’ll need powerful back ups. Check out our bundles for more savings. Short, No-Tangle Solution to Charging The ARC cable was designed to help you charge your d..
Form, Function, Beauty, Innovation… In A Charger? Yes! No need..
BOLT2: Power 2 Devices – Grab & Go Bolt2 is there for you as a back ..
For the minimalist traveler, charging-cord-emergencies, hanging out (& hanging on)..
A clip that doubles as a device charger Ever find yourself out and about, or .. Here is your newest Solar Hero = A 2-in-1 Supercharger The PackLite Hero 2-in..
A modern update to the classic bi-fold. This wallet discreetly holds a full ..
Key is a tiny high speed charging cable for your iPhone & iPad Made from ..
Key is a tiny high speed charging cable for Micro USB devices Made from ultra.. Compact Charging For The Weekend Set up your Pod Pro with the included USB-chargting ca..
PowerPack with Tile® Tracking An ultra rugged, compact 9,000mAh bac.. The Nomad Battery Cable Connector The Nomad Battery Cable combines a durable,.. The Nomad Slim Wallet with Tile® Tracker Slot This wallet was designed t..
A Rugged Link To Power The one cable to rule them all, Universal cable comes .. The PackLite Max 2-in-1 Phone ChargerA solar inflatable lantern & phone charger ..
We USE eviDence-based memory science to OFFER beautiful solutions for your lifestyle. Should I Take the Guide? Get Social: Post & win! Contact us for employment as a lifeguard, beach comber, or other opportunities. Follow us on LinkedIn for more. Reminding family members or helping others for a living? Click on the images below for all your personal care needs.